The HP LaserJet 3015 is all-in-one multifunctional printer that offers printing, copying, scanning, and faxing. 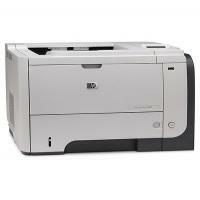 It offers speed and text quality of a laser printer along with a basic sheet-fed scanner. The sheet-fed scanner on the printer includes a 30-page automatic document feeder. The scanner and ADF are mounted on top of the laser printer that makes the unit look like a laser-based fax machine. With dimensions 17.5 by 16.8 by 18.5 inches (HWD), it's compact enough to be a comfortable companion to one’s personal desktop. The front panel offers a menu-based LCD, a numeric keypad, and several other buttons nicely divided into groups that make faxing, scanning, and copying an easy task.The control panel manages to be intuitive and easy to use, and one can even access it via PC. Print speed and text output are among strong points of the printer. With HP Laserjet 3015 toner cartridges, text quality is nothing less than excellent as most of the fonts are easily readable at 4 points. But its graphics and photo output are not in the same class as of its text output. Graphics output are just acceptable, showing obvious dithering and photos are worse, with some photos showing unacceptable posterization. So if one is intended to print high-quality pictures, newsletters, copies and scans, it can fall a little less than the mark. Despite the shaky photo performance, the HP Laserjet 3015 remarkably capable for the given price. If one is looking for a low-cost personal multifunctional printer with printing, scanning, faxing, and copying capabilities and don't need to scan photos or pages from books this is one of the models one should consider. Q. I have recently purchased the compatible HP LASERJET 3015 toner cartridges from your site and it has some fault. How can I return the product? A. If an item fails to operate or is faulty, you can return the order within 30 days of purchase. We'll give you a replacement or a refund once the item has been returned to us and tested. For more details go through https://printerinkcartridges.ie/return-policy. Q. What is the page yield of compatible HP LASERJET 3015 toner cartridges? A. HP LASERJET 3015 toner cartridges can print upto 3000 pages. Q. Is there a difference in print quality when I use compatible toner cartridges for my HP LASERJET 3015 printer? A. We try and find the best compatible toner cartridges for your HP LASERJET 3015 printer, which is why all of our compatible cartridges are tested to the highest quality standards to give you the same high quality print outs and page yield as that of the original cartridge. Q. How can I cancel my HP LASERJET 3015 toner cartridge order? A. If the order has not been dispatched, we will just cancel the order and refund payment in accordance with our refund policy. If the order has already been dispatched, you can refuse to sign for on delivery (if the product needs to sign for) and we will refund the payment in accordance with our refund policy. Q. How can I install the HP LASERJET 3015 Toner Cartridges on my machine? Open the front cover of the printer. To prevent the cartridges from damage, it is suggested that not to expose them to light for more than a few minutes. Remove the HP LASERJET 3015 Toner Cartridges from the bag and thoroughly shake them to distribute the toner evenly inside the cartridge. If the toner comes in contact with your clothes or hands, wipe it off with a dry cloth and wash in cold water. Hold the toner cartridges using the handle and then slide it into the printer until it locks firmly into the place. Q. If I need HP Laserjet 3015 toner cartridges to be delivered at a short notice, will you be able to do that in a day? A. All our orders are delivered by Fastway Couriers and your order will require a signature on delivery. Approximately 90% of our orders received before 12 noon daily are despatched same day (subject to stock levels) and delivered on a 1 - 2 delivery day basis with Fastway Couriers. Ring us on 048 30833221 to check stock if your order is urgent. Q. Will HP invalidate my printer warranty if I use compatible toner cartridges? A colleague who installed compatible cartridges has been continuously receiving alerts from HP to that effect. A. No, your printer warranty won’t be negated if you use compatible cartridges. These alerts can be bypassed and compatible toner cartridges can then be used normally. Q. I installed compatible HP Laserjet 3015 toner cartridge in my printer recently but the printouts I’ve been getting are faded. Are the toner cartridges faulty and should I return them? A. Please run a cleaning program on your printer. It’s likely that the nozzles are blocked, which can be dressed by cleaning them up. If it doesn’t solve the problem, please contact our customer care team and allow them to guide you further. Q. Do you offer a full refund in case a customer chooses to opt for that in case of the quality issue? I’m planning to place an order for compatible HP Laserjet 3015 toner cartridge with you for the first time, so thought of getting a clear picture over this… Thanks. A. Yes, we do offer a full refund for up to 12 months if you are not happy with our supplies. Same applies to the toner cartridge you are interested in purchasing from us. Along with full refund, we will also not get you to pay anything for shipping it back; we foot the entire expenses in that case too.